rendnet's TWC-L10 Indoor HD Wi-Fi Light Bulb Surveillance Camera is worth your money if you want a two-in-one smart device to illuminate and monitor what's happening in a room from above. 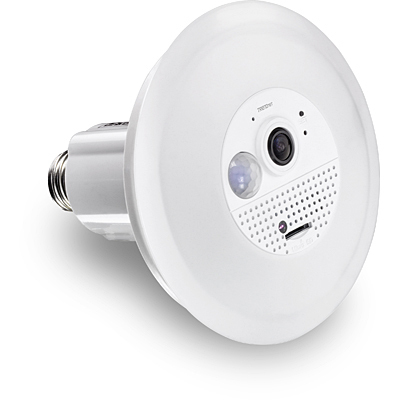 The TWC-L10 combines a recessed 40W replacement LED with a 720p HD live streaming camera. It can detect motion, save recorded video clips locally to a microSD card (cards can be up to 64GB, but are not included) and has an integrated microphone along with a speaker for two-way audio. Trendnet's TWC-L10 costs $100 and is currently only available in the US. The camera's wide-angle 185-degree lens has digital pan and zoom capabilities so you can see a whole room with relative ease, but details like a credit card number or a phone's access code would be too blurry to make out. While the TWC-L10 delivers prompt motion alerts, the camera really struggles to capture detail. Instead, you'll get a distorted, aerial fisheye view. And you're pretty much stuck with only seeing the top of a person's head -- unless they happen to look up at the light. The TWC-L10 has a standard-size socket and is designed for use in recessed ceiling lights -- or arc lamps. An adjustable base gives you leeway with different fixture sizes and styles. 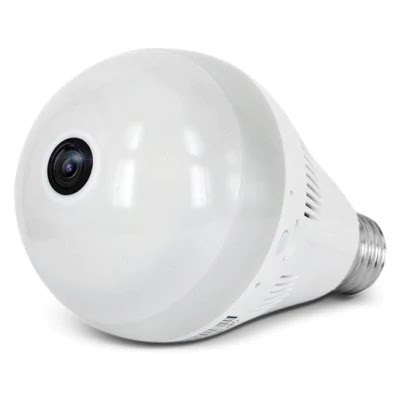 It's rated at a 360-lumen light output, just under what you'd expect from a 40-watt incandescent bulb, and a 3,000K "warm white" color temperature. Read more about lumens and LED color temperature here. Trendnet's LED-security camera hybrid installs easily, simply screw it in the socket. It looks OK overall, but I wish the clunky-looking central panel was more streamlined. While all of the above cameras emphasize discreet design, the TWC-L10 is more of a "hidden" camera than its counterparts. You can see the lens, but how often do you look up into a recessed light fixture? As a result, you'd want to disclose the TWC-L10 to friends and family, because it definitely blurs the line between a security cam and a spy cam. 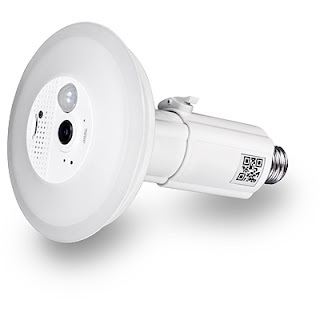 Trendnet's TWC-L10 works fine as an indoor recessed light with an integrated HD cam, but it doesn't currently support Amazon Alexa, Google Assistant or any other major smart home platforms.